Philippine Art – "Every literary product is an impure product." 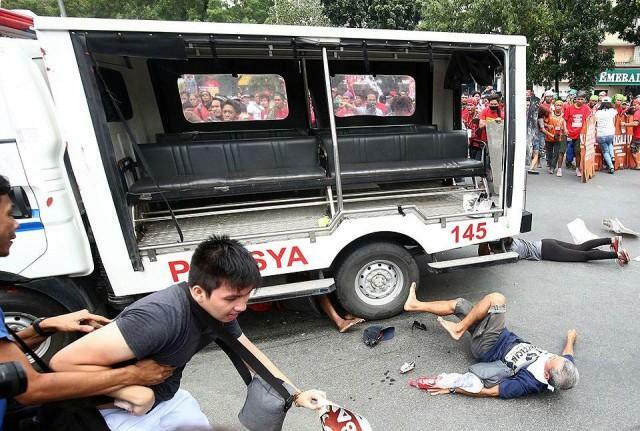 The visuality of a political regime is typically at its most striking in journalism, whether in state-sanctioned reportage, or mainstream media coverage. Among the images that have found their way into a nation’s consciousness, we find a young woman mourning the death of her partner, weeping while cradling his broken body, children squatting candidly around the candles where a relative had fallen; here is a bloodied altar in a home said to have been raided by plainclothes policemen; here are more policemen doing push-ups as their Chief looks on, appearing to berate them; here is a Christmas party at the mall, held for children who had lost their parents in the ongoing war. Hanging over all of this is a closed fist – iconic of the promise for change that continues to resonate with the millions who maintain their own promise of unwavering support, amidst the gunshots and the rising death toll. These images come to us—viewers and citizens—in fragments, often attached to headlines that fail to capture the reality on the ground: “the ground” often feeling like another country altogether, a dystopia far removed from the absurdity coming at us through social media. That everyone has a camera and an internet connection these days fulfils a steady demand for something new to look at, whether out of habit or out of indifference: the friend making dinner, another friend’s winged eyeliner, flatlays made to look as if they were taken in someone’s impeccably clean home, and more art, always more art. Then in this steady stream of the inane and mundane, one image somehow rises to the surface. It is a foot. It is not even a photo but a detail from a photo: the foot is zoomed-in and scaled-up to fully occupy a heavily pixelated square. 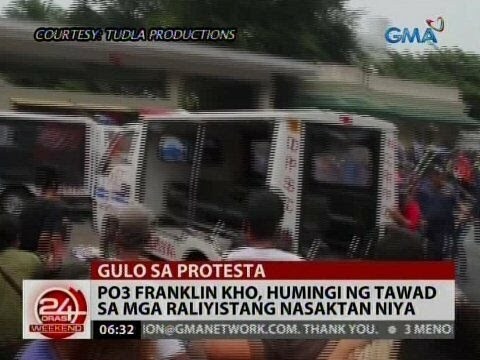 A foot trapped under a tire, flexed, tense, probably numb from the excruciating pain of being crushed beneath a van driven by one officer Franklin Kho. A foot – dismembered several times over, first beneath the crushing weight of Kho’s vehicle, then removed from its context, captured digitally, edited onscreen, then posted online where it is subjected to the malleability of individual opinions. Collage, as a medium and method that borrows freely, often with irreverence and good humor, finds a natural fit in this layered act of dismemberment that has come to define how we interpret information in the age of Post-Truth – resulting in a confusing visual language made universal through the collapse of time and space made possible by globalization. Collage succinctly describes how living in the Age of Information has altered not only what, but how, the eye sees; in which acts of dismemberment illuminate the dangers of allowing violence to go the way of banality, pointing out our complicity not only as viewers, but as consumers of this violence. Cutting and pasting traces outlines of the carnage, while taking care not to make a spectacle of the pain of others; asking instead, in times like these, what is art supposed to achieve? In Never Missed/Never Will, Jel Suarez confronts how the injustice we often see online, becomes reduced to the mundane: “Never missed” referring to the recent waves of state-sanctioned murder that, in their ubiquity, now barely merit a reaction. By rearranging what we are used to seeing, or what we expect to see, Suarez’s collages turn an aesthetic gesture into a critical method, foregrounding what we lost when our capacity to express outrage became reduced to mere icons. Another unedited excerpt! This time from a review of Planting Rice’s Articles of Disagreements, which ran at the Lopez Museum from September 19-December 20, 2014. This was also written for this month’s issue of Art+. What makes a masterpiece? To Filipino art audiences, the term is typically associated with works that command reverence through the sheer spectacle involved in their display. Entire rooms are dedicated to single pieces, which are then placed under lights and behind glass. The spectacle of mastery is confirmed—applauded—by awards and a history (which usually just amounts to something being really, really old), adding up to incalculable value. To the casual museum visitor, the masterpiece validates both the cost of admission and the time it took to get there. This calls attention to a curious gesture made by Planting Rice, a contemporary art platform founded by curators Lian Ladia and Siddharta Perez. In the exhibition Articles of Disagreements, which ran at the Lopez Museum—an institution known for its masterpieces—from September 25 to December 20, Ladia and Perez removed the works of Juan Luna and Felix Resurreccion Hidalgo from their exalted posts as central subjects of past exhibitions, and relegated them to the literal back end, where they hung in the library as archival pieces. The next step involved trading places, making space for the contents of the library in the central locations—locations where frequent visitors had become accustomed to seeing the Lopez family’s prized collection of 19th century art. Thus, prompting new questions for museum visitors not about “What makes a masterpiece?” but about what one usually expects to see in museums. This, Planting Rice seem to propose, is where the critics come in. There are levels to criticism that are not as evident to audiences and markets, who are better acquainted with the published form often encountered in print. As a professional designation, the critic’s work is often relegated to catalogs, the walls, or in magazines, making the curatorial pursuit to “unearth the different forms of art writing and anecdotes of criticism in Philippine art history” particularly relevant. To limit this seemingly unwieldy field, Ladia and Perez made it a point to focus on a specific cluster of major texts that Ladia found in the library archives, taking liberty with the methods of curatorship unique to the Lopez by reconfiguring the term “permanent collection” to mean the holdings of the library and archive. Writings and other forms of documentation by Ray Albano, Joy Dayrit, Patrick Flores, Pete Lacaba, Purita Kalaw-Ledesma, Judy Sibayan, Bobi Valenzuela, and Fernando Zobel worked as guideposts for selecting complementary artwork. To speak of “unearthing” is to acknowledge the titular “articles” as having been buried in the past, resulting in an exhibition permeated by nostalgia for a period in which criticism referred to published work. This highlights the different levels and venues in which critique takes place, showing how art criticism is not written solely by art critics, but is a dynamic and ongoing process that takes place both formally and informally, in classrooms or over drinks. In Nilo Ilarde’s There’s always a nail in a wall somewhere that can take a painting (2013), criticism is poetically framed as a process of perpetuity. The titular nail is hammered into place between two mirrors, propped on borrowed easels and made to face each other, the nail in the wall is thus infinitely reproduced through reflection. Unearthed and critiqued through the work of Maria Cruz is the theory of value, often unquestioningly attributed to the masterpiece. Rather than taking value as a given in artistic production, Cruz’s Circles and Names playfully solicited donations from the surrounding community to make material worth and collaborative effort visible. For Cruz, the mission is to collect one million coins (she is halfway through as of this writing), seen in the circles and names she paints in her work. Circles in this case refer not only to the coinage that represents her subject, but to the people in her midst who have made it possible, or the ones she has named. The time it takes to finish watching the video of Cruz speaking about her work, Circles, testifies to the time one is willing to give to the realization of her project, highlighting the importance of community in the art world. Cruz’s contribution is one of many that openly questions what counts as criticism by representing it as an art form in itself—by hanging it in a gallery, acknowledging its material formulation as education, as collaboration, as commentary, or as documentation. By framing critique as communal, Circles expands the definition of “criticism” beyond published work, accommodating the exchanges that take place in the informal and intimate spaces, exposing viewers to the a world of work that frames art-making as just another job. A spectrum can be drawn to illustrate the variety of jobs taken by artists to make ends meet, from the classroom-like tribute to Anselmo “Bobi” Valenzuela to Employee 55, where painter Buen Calubayan creates an office space out of an unpopular profession, shedding light on the removal of the representation of the artist at work from artwork itself. This also unfolds the contentious cycles of converting language in the multi-sensory experience of exhibition making. This point of contention makes it particularly apt that one’s experience of the exhibition begins in shadows. The narrow hallway leading to the Lopez Gallery is painted black, and on the walls are reproduced photographs of installation views which bear markings Raymundo Albano himself made by hand. From there, the exhibit engulfs its viewer in text: in private correspondences, handwritten captions, and scrapbook clippings, all of which expose a private life of art production and curation, captured in words. It is worth noting out that the Lopez Museum was founded on an intellectual tradition that encompassed journalistic integrity and criticality. The Manila Chronicle, one of the earlier Lopez holdings, had artist H.R. Ocampo in its staff; its leading opinion columnist, I.P. Soliongco, is credited as Don Eugenio Lopez, Sr.’s first adviser in assembling the art collection and library; and the museum’s first curator was none other than nationalist historian Renato Constantino. This made it a fitting location for an exhibition on the written word, where art is treated not as merely visual, but as a critical device. The usefulness of Planting Rice’s historiographic strategy for curation is another issue altogether in the age of information, where we speak not of “articles” but of “content”, of “aggregation”, and would trade any amount of criticality for “media presence”. From behind the closed doors of a small space, it brought to life the documents that will continue to defend the value of claiming that “The critics loved it!” But for now, we speak of going viral as if articulation were some kind of disease—which it probably is, considering the concept of art criticism as a vocation that needs to be unearthed. This is an unedited excerpt from an article I wrote, coming out in this month’s Art+, reviewing Micaela Benedicto’s recent solo, Structures of Unremembering, by revisiting the work of other artists who use similar media and concepts. For this, it was M.M. Yu’s Memoirs (2001) and Thoughts Collected, Recollected (2007). What exactly is “taken” in the act of taking a picture? Messages? Evidence? An impression that demands that one “See here.” We have heard the entire spectrum of warnings and accusations: “Pictures or it didn’t happen.” Thus, making it a worthwhile exercise to revisit the medium, long after the age of mechanical reproduction, immersed in the economy of attention and information. The ambivalence between milestones and the mundane has consistently figured in the photography of MM Yu, whose work challenges the concepts of framing and display that are often overlooked in the photographer’s quest to capture the picture-perfect moment. In Thoughts Collected, Recollected (2007), her work is pressed into albums and placed on unvarnished wooden shelves. In Memoirs (2001), first shown at the La Trobe Visual Arts Centre in Australia in 2008 before moving to the Ateneo Art Gallery in the following year, Yu uses one thousand multiple exposures to wallpaper a section of the gallery, in a seeming reversal of the saying that “A picture is worth a thousand words”. How about a thousand pictures? Confronting the viewer with this “wallpaper of light” (to quote Ringo Bunoan), Yu exposes the inadequacies of the surface, whether it’s in print or on a screen. Her work speaks of how what gets captured is a mere selection, despite the multiple technologies that allow us to document our experiences. Using an antiquated medium, she takes pains to wind celluloid back in a process of revisiting the recently captured, and instead comes up with the reality of exposure as simultaneously allowing subjects to surface and be released. The act of making memories comes with the inevitability of erasing or distorting the past. A reversal of Yu’s process is seen in the work of Micaela Benedicto. While Yu’s work brings viewers into intimate connections with what has passed, inviting them to take it off the shelf, browse through it and turn it in their hands, Benedicto treats the past as another country. 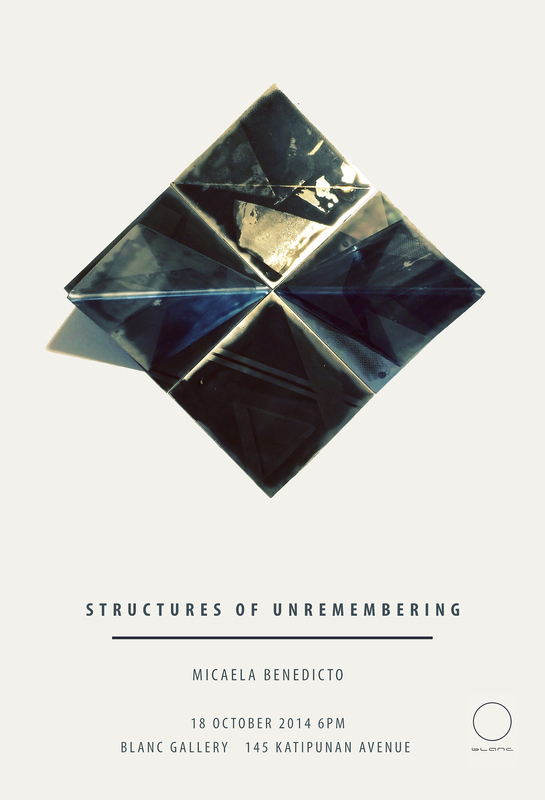 Between sculpture and image, her series Structures of Unremembering (2014), which was shown at the Blanc gallery last October (and again as part of a group show at West Gallery in December), consists of structures that are simultaneously traces, reflections, and impermeable layers anchored to pristine surfaces. Structures of Unremembering does not deviate from the minimalist aesthetic of Benedicto’s past works, both as an artist and an architect. Unlike Yu’s hypersaturated jewel tones, Benedicto makes little use of color or curves; yet it is in the layers impressed upon the work that a story unfolds, making her structured photos a literary rather than architectural gesture. This recourse to narrative, or to fiction, not only reflects the malleability of the past but the ease with which our memories can betray us.